8-12 INCHES FOR MIAMI, THE STORM HAS UP TO 24 INCHES OF RAIN IN IT. Most recent info. puts Tampa as the point of impact. The Florida Information Emergency Line is 1-800-342-3557. Lines are very busy, so please keep calling to get through! FURTHER REMARKS: I don't want to tell you what I have seen on some of the modelling with Jose, how much is 250 knots? And there is another one after Jose. For now, prayers go out to Floridians, and Atlanta it will be coming your way after it is done with Florida. There were reports that Macon was already a big parking lot, so that may get worse since 6.5 million of the 20 million residents of Florida were now told to leave due to irma. 20 million residents, a 10 foot storm surge, 6.5 million told to evacuate. These news media sources have good info. Remarks: It could have been worse, IF Irma hit Miami head on as was anticipated. So maybe the govt. did steer it away from the shorelines as much as possible. One other thing going on is that we may be in the beginning stages of the pole shift. Which will cause more intense storms to happen. Are you aware that there was a quake yesterday along the Juan de Fuca plate that caused the tectonic plate boundary to move 32 feet? Are you also aware that when the pole shift happens, and some say 9-23-17 is the date it is expected to, when the shift happens, the new pole will be off Brazil? That in and of itself will cause all kinds of weather changes. The press is not supposed to say 'climate change' anymore, they have some other catch phrase but all this stuff is going on. RE: JOSE, one of the models has it coming pretty far north by 9-17-17 before heading out to sea. We will have to be on the lookout. The axis of the earth has changed. This in turn effects the weather due to the gravitational pulls, the geomagnetic grid etc. The people who noticed it back in 2015 were the Inuits who live along the Artic. What NASA did with the info. is not known. Each of the strong earthquakes we have changes the axis of the earth. I heard recently that the Mexico quake moved the Juan De Fuca tectonic plate 10 or 12 feet. The large quakes in previous years in Fukushima, Christchurch, New Zealand and Chile, also effected the axis of the earth, which effects the rotation etc. When the pole shift happens people are now saying the new pole will be in Brazil. Others say we may be in for a new ice age coming. Moon not where it should be rotated to the right, or earth has rotated to the left. The Torah even said there would be changes in the moon and it gave the year which translates to 2011. There is someone who has figured out what happened. The poles have moved. The new north pole at this time is off of London, it is closest to Stonehenge. The new south pole is at New Zealand. The moon flipped on December 11, 2011, 1 1/2 hours later it had rotated 180 degrees. Antarctica shifted 90 degrees. The poles are not going to stay in these locations forever. Eventually the new North Pole will be in Russia and the new south pole will be in Cape Town, South Africa. When the land changes occur, the part of Africa that has Capetown in it, will move and shift going to the position that Antarctica is in now. The thing is this, we are used to the equator being in the middle of our earth. The new equator will not be there. The magnetic grids of the planet will be changed. This has already effected airports where they have had to adjust where their landing strips are because the equipment the pilots fly by is no longer accurate to the runways, when they set the course for the plane, it has to adjust for these changes. People keep talking about climate change noticing the weather changes, but it is not due to climate change like too much smog going up there influencing the weather. The problem is the tilt of the planet has changed, which means it does not face the sun the same way. The planet rotates on it's axis and it is now tilted differently. This effects the crops and food sources, it effects the ice in the arctic etc. which is melting. This melting ice changes the salinity of the oceans, which effects the storms including hurricanes because there is this symbiosis between the oceans and the sky/atmosphere. Greenland experienced differences in their daylight and why the Inuits up there in the arctic are getting more hours of daylight. This is due to the tilt of the earth changing and putting us closer to the sun. The tilt of our planet is now 92,000,000 miles from the sun. Previously it was 94.2 million miles. So now we are closer to the sun in certain places. North America, Europe, China, India, reportedly will become "unbearably hot" in the what is normally our winter time (January). Yes the climate will change, but it is due to the change in the axis, tilt of the earth, as well as the rotation. The new north pole is currently located at North 51 degrees, 22.949 East, 12.922 degrees. It is located off Herne Bay, England at 23.4 degrees. The new poles are temporary, it is still migrating. Nibiru has caused this. Why is this happening? It is how God will destroy the peoples he said he would destroy. The heat will destroy the crops, famine, pestilence will occur, the heat will kill many and some people will freeze to death if they remain in areas that will no longer support life. I will gather more info. to expand on this. Axis shifts have happened before. Here is info. on one of them. JOSE - it will not be doing anything that could be a threat to any land mass till late next week and it may not come in at all. it is complicated. Bernie understands all the possibilities and points out what is going on. I did see a model that had it just off the Jersey shore on Thurs. the 21st, but it is too early to say that is what will happen. If it did go in there, it would be in the same areas as Sandy, so we do need to check in on this storm. JOSE - timing and locations and effects. The storm is expected to track southeast of Long Island on Tuesday afternoon and southeastern New England by Tuesday night into Wednesday. Due to the influences discussed above, Jose will be a larger storm by the time it comes close to these areas, however the current forecast from WeatherOptics meteorologist keep the worst impacts off the coast at this time. Expected to be a tropical storm by Tuesday, Jose will likely produce winds around 30 to 45 mph with gusts up to 60 mph along the immediate New Jersey, Long Island, Connecticut, Rhode Island, and southeastern Massachusetts coasts. Rainfall amounts will range from 2 to 3 inches around Nantucket, 1 to 2 inches over the rest of southeastern Massachusetts, and 0.5 to 1 inch of rain along the immediate New Jersey, Long Island, Connecticut, and Rhode Island coasts. Minor to moderate coastal flooding will also be a threat along the New Jersey coast up to southeastern Massachusetts, along with a very strong rip tide. Maria WEDNESDAY 2 p.m. PUERTO RICO CAT 4 130 miles per hour. THURSDAY 2 p.m. DOMINICAN REPUBLIC CAT 2 up to 110 miles per hour. I'm not going beyond that yet. Update: Maria will NOT go thru Florida, it will turn and come up in the Atlantic and is not supposed to hit any land. Update 9-21-17 After Maria is done gong thru the Carribean Islands and the Bahamas, it is believed that it will go out in the ocean and not strike any other land. Mexico is facing another large quake, in the 6 range, according to an earthquake prediction specialist. Okinawa and Guam may have quakes in the mid to high 4 ranges. The Agean sea, and other areas also, even potentially Tennessee and Virginia in the 3-4's within 3-4 range. Thursday 9-28-17 an 80% increase in geomagnetic storms. Mount Agong, a 10,000 foot volcano in Bali erupting. Evacuations issued. Magma moving towards the surface. 7.1 possible between 9-28-17 and 9-30-17 for Mexico, same areas as hit recently. Additionally, there is a system (storm/hurricane) that is expected to form near and go over Cuba. It can either go over Florida and come up the east coast, or go in the Gulf. What is eerie is that there was prophecy from 2015 which says that Houston will be destroyed by water, Los Angeles by earthquake. Winter coming early to Siberia. 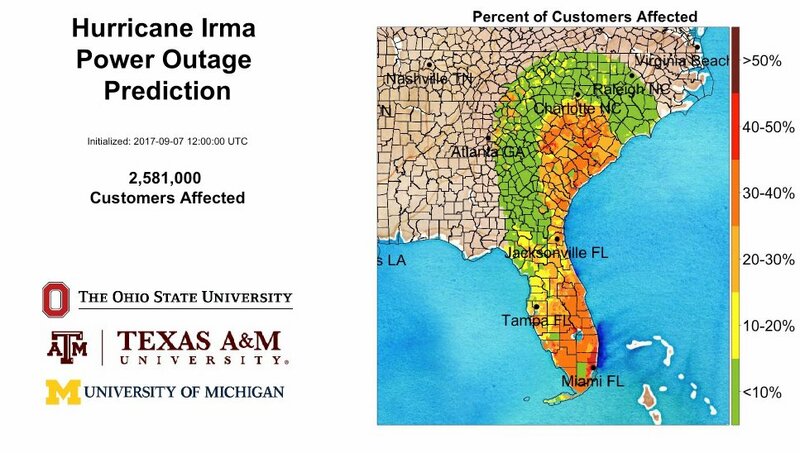 186 hours out from now: Southern Florida has a storm to deal with, that is expected to go up the east coast of Florida. Also, after the first week of October, more storms are expected to be coming off Africa. Nibiru is Jupiter - the Sumerians (yes from the Bible) were from Jupiter. Yes there will be another hurricane, will be named NATE, it is believed at this time to be heading to either into the Gulf near New Orleans, or near the Panhandle of Florida. Impact Sunday 2 pm or thereabouts. I looked at the storm this morning, now the guestimates are that it will be more than a low range Cat 1. More later, I am exhausted, but at least you got a little heads up. Apparently there is info. suggesting that the storm will reach CAT 4 status, yet most of the other weather people are STILL saying it would hit the Florida Panhandle as a Cat 1, 75 mph storm on Sunday, so I don't know what is going on. Nate made landfall over northeastern Nicaragua late Thursday morning as a tropical storm with 40 mph winds, and tropical storm warnings are up for much of the coast of Nicaragua and Honduras. However, the main danger to Central America from Nate will be torrential rains: 15 – 20” in Nicaragua, 5 – 10” in Panama and Costa Rica, and 4 - 8” in Honduras and the eastern Yucatan Peninsula. Much of the heavy rain in Nicaragua, Coast Rica, and Panama will occur on the Pacific side, as Nate’s large circulation pulls moisture from the Pacific across Central America and into the Southwest Caribbean. Satellite rainfall estimates show that the heaviest rains from Nate thus far have been on the Pacific side of Costa Rica and Panama, where over 8” of rain has fallen over the past 7 days. 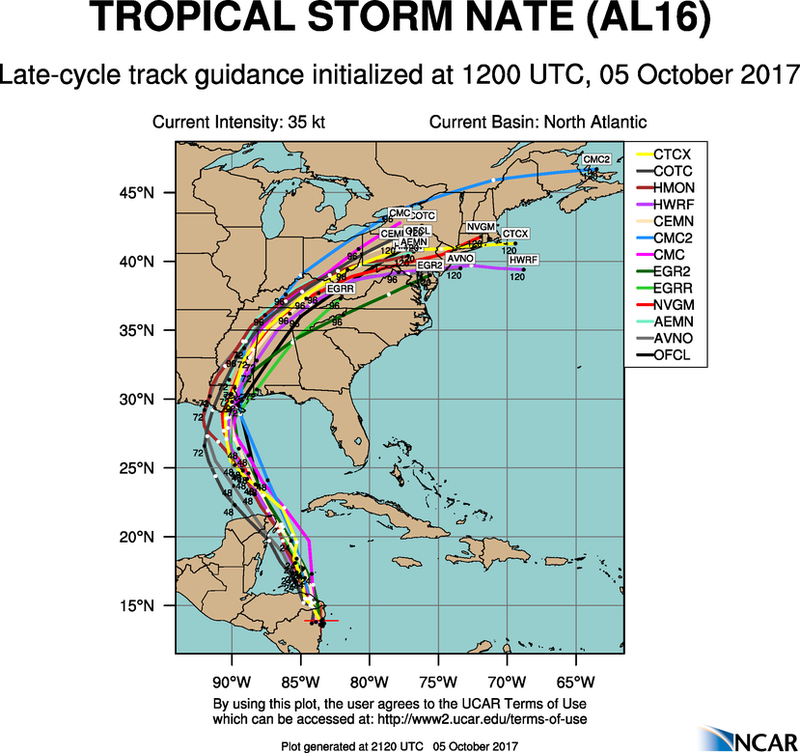 By the time Nate reaches the United States, its quick movement will help limit the risk of extreme rainfall totals. A swath of 3 – 6” can be expected within about 150 miles of Nate’s center, from the Gulf Coast north across the Appalachians to parts of New York and/or New England. 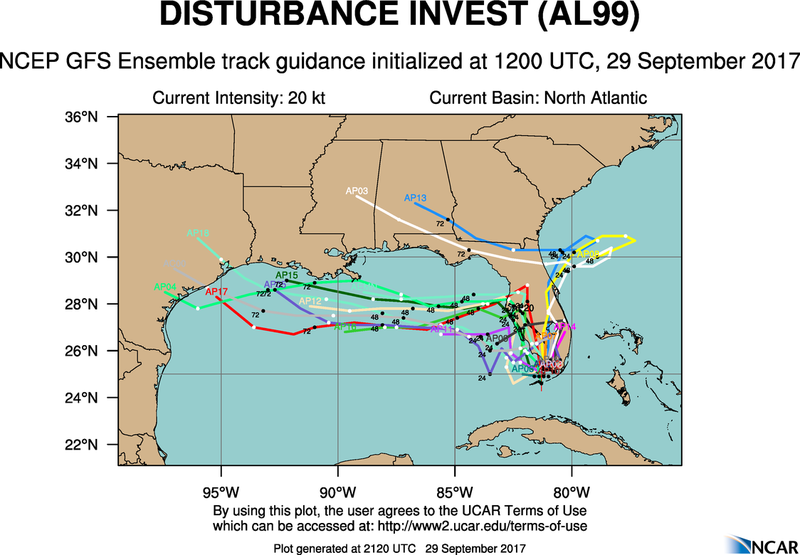 Folks, it ain't looking so much like landfall for the Florida Panhandle. As to why there is discrepancy among the models. The European thinks it would be the Florida Panhandle, but the GFS does not. It gets complicated because of troughs, windsheer etc. Levi did a very detailed video yesterday about the variables. Ryan also thinks it looks more like New Orleans for this storm. The meteorologists today have said they believe NATE will come onshore as a Cat 1 or weak Cat 2. The impact zone is still believed to be New Orleans. This was Bernie's video from yesterday. A storm surge warning is up for the Gulf Coast from Morgan City, LA to the Alabama/Florida border, as well as along the northern and western shores of Lake Pontchartrain. In these areas, 4 – 7 feet of inundation were predicted by NHC in their 11 am EDT Friday advisory, assuming that Nate were to arrive during high tide. I sure hope they don't make Jim Cantore stand out there in NATE to show people how bad it is. It's Yom Kippur, have mercy on him, I'm sure he is repentent. Also, there is another system within 5 days there is a 70% chance of it forming into a storm in the Atlantic quite a bit North of Florida. Too soon to start speculating on that yet, just be aware it is there. Remarks: Why all these storms? Well it could be the folks who believe they will "own the weather" by 2025, or it could be God who told you in the Bible that men would faint from the roaring of the seas during the tribulation times. When I look these hurricanes, I look to see if it looks perfectly formed, those are the ones I think are from God, the ones that are perfectly symmetrical, the ones that confound the weather scientists who say the storms are not doing what they should be doing because God controls and does what he wants to. Bottom line is, the coastlines will be pummelled and hammerred if not by the 'we own the weather' people, then consider it God who is starting to unleash his punishments on an unrepentant nation. Inundation map and how high they think the water will go. you can see the areas where more than 6 feet storm surge inundation is probable. Asteroids coming by increase the chance of earthquakes. Heads Up west coast! Are we overreacting to the hurricanes? Nope. "A strong tropical system centered a few hundred miles east of the Leeward Islands is being watched for possible development late in the upcoming weekend or early next week," Kottlowski said. Kottlowski anticipates that the only landmass that would see direct impacts from this system if it does develop would be Bermuda. "I think there will be at least two more tropical storms, of which one or two can become a hurricane into December," Kottlowski said. "There is still a chance of one more major (Category 3) hurricane." Remark: Hurricanes in December? Whippin post! Space - Unprecedented Space Discovery from Resarchers in Chile and Europe. Announcement Monday October 16 from Germany, "limited bonafide meeting event", they do have a photo of a brown dwarf star, could be nibiru. European Southern Observatory Media Event at 1600 CST, central standard time. There's all kinds of stuff going on up there in space. Here is a sample. What is the actual truth about space? There are other life forms and entities up there. Alien beings, the Annunaki and Sumerians spoken of in the Bible were real. They came from someplace else. The Pyramids in Egypt were built by the knowledge given to the locals by aliens. Etc. Now the meteorologists say Climate Chaos, because that is what we are experiencing, the climate is in chaos. The magnetic poles have shifted. They just don't talk about that. The new north magnetic pole is off London, close to Stonehenge. So now Cat 3 hurricanes can go to Europe.